Rochelle Lauren is a freelance writer and adventuress. She spent a year living in Dublin, Ireland before returning to her hometown in Canada, where she now writes for several online publications. 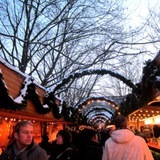 If you've been fortunate enough to travel to Germany in November or December you will understand the pure magic of a German Christmas Market; the lights of each wooden booth glowing warmly upon the trinkets for sale; the smell of delicious bratwursts wafting amid the sweet and spicy mulled wine; the snow falling softly from the night-lit sky. The air itself seems bursting with Christmas cheer. For any lover of the holiday season, a traditional German Christmas market is a must -- and this year you don't even have to leave town! For the fourth year in a row, Vancouver will be holding an authentic German-style Christmas Market at the Queen Elizabeth Theatre Plaza from November 22nd until December 24th. Based on a traditional Weihnachtsmarkt, the Vancouver Christmas Market will feature festive live entertainment, charming wooden vendor booths selling a variety of ornaments and gifts, and (of course) copious amounts of traditional German-style food and drink. There will also be plenty of activities for the kids at the special Kids' Market including Downtown Vancouver's only Christmas carousel. Not only is this a fun and festive holiday activity, but it's an affordable one as well. Tickets run in the single digits with lower day-time and child rates, and one ticket will get you into the market all season. Whether you're Scrooge looking to lift your spirits or Buddy the Elf looking to bask in all its cheer - wander through the Vancouver Christmas Market this holiday season!